Step 2) Once that down trend line is crossed, then a buy should be triggered. When one index forms a descending trend line and attempts to break out, it’s possible that other indices could form an ending diagonal. For example, here the Dow Jones forms a descending trendline while the Russell forms an ending diagonal. The day before the event, the major indices made a new low and started to reverse. Opening the morning of the inauguration – it looked like the index was ready to move up and it popped over the down trend line (step 1) – but then at noon, when Trump raised his hand to swear in, the markets plummeted back down. The critical moment was the overnight session between Jan 23 and 24 (step 3)- by simply holding there rather than moving a lot – indicated that the index was ready and coiled up to break up through the down trend line. 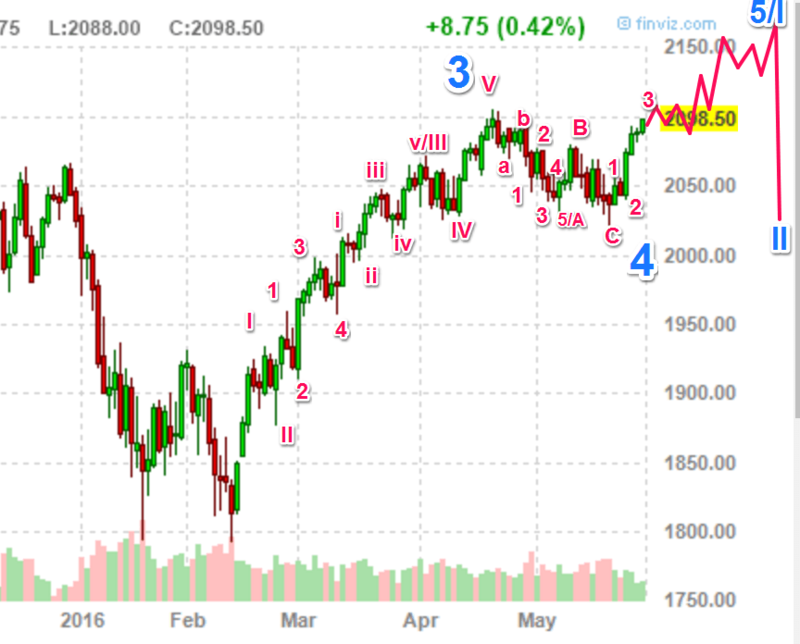 Between “3” and “4” – we have a down trend line that includes the pink B wave failed rally. That imaginary line intersects around 2060 — so on a daily time frame, a buy order at 2060 would be prudent. Zooming in, the 2260 region was basically the market open on May 24, 2016.